Lovely studio cottage perfect for two!! This waterfront cottage is the simple escape you have been dreaming about. Share this special space with someone you love (or just like a whole bunch). 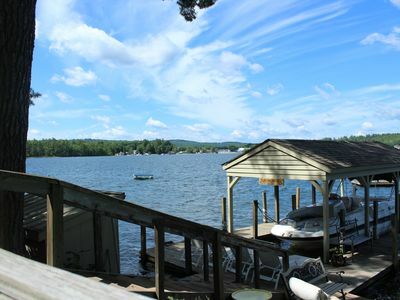 Located on picturesque Varney Point in Gilford, enjoy beautiful views, swim across to Gilford Beach or splash your feet in the water from the dock and soak in the sun. This cottage offers two twin beds that are often pushed together making a king. The kitchenette has a sink, microwave and fridge. No oven or range is provided. There is a gas grill for cooking on the deck. The owners live in the main house on site and are very accommodating (really sweet people!). You have use of one side of the boat dock for your boat or water toys and every guest has open use of the kayak and swim raft. Gilford Beach Pass is available at the cost of $25.00/tenant, please let your booking agent know you are interested in this option. This cottage can be rented monthly as well. Please ask an agent for details.Owner will allow one dog and pet fee is an additional $150.00.PLEASE NOTE: linens and towels are not included in this rental. Please inquire about renting these items when confirming your reservation as they are first come, first served. Although we take every precaution to keep listing details current and accurate errors in prices and descriptions may occur in our literature. We reserve the right to correct any such error. State of New Hampshire Meals and Rentals Tax Operator's License #059997.